SMS Blücher was the last armored cruiser built by the German Kaiserliche Marine. She was built as a response to what German intelligence at the time believed were the specifications of the British Invincible class battlecruisers. 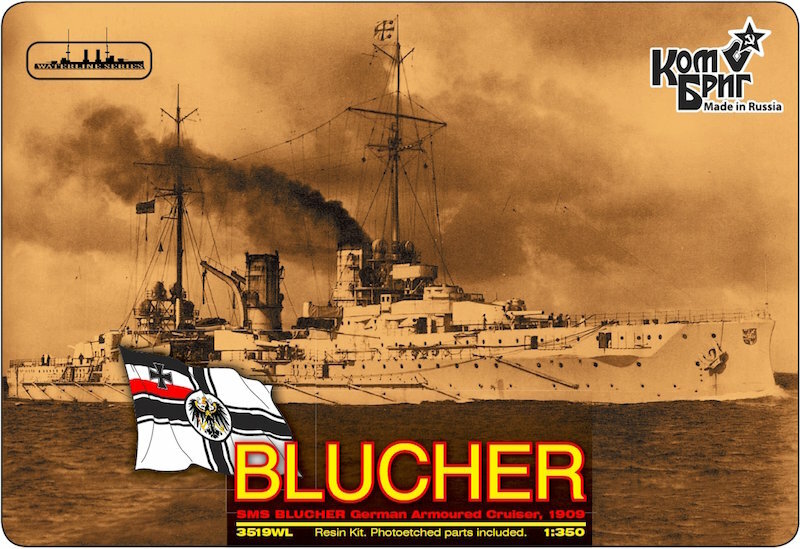 Blücher was considered to be an intermediate stage toward the future German battlecruiser; she was larger than all preceding armored cruisers and carried more heavy guns, but was not equipped with guns as powerful as those on subsequent German battlecruisers. Blücher was built at the Kaiserliche Werft in Kiel, between 1907 and 1909, and commissioned on 1 October 1909. The ship served in the I Scouting Group for the majority of her career, including activity in the early portion of World War I. She took part in the operation to bombard Yarmouth and the raid on Scarborough, Hartlepool and Whitby in 1914. At the Battle of Dogger Bank on 24 January 1915, Blücher was slowed significantly after being hit by gunfire from the British battlecruiser Princess Royal. Rear Admiral Franz von Hipper, the commander of the German squadron, decided to abandon Blücher to the pursuing enemy ships in order to save his more valuable battlecruisers. She was sunk at 13:10 with great loss of life, having been subjected to heavy fire from the British ships.